This collection of The BEST Low-Carb and Keto Instant Pot Chili Recipes offers up delicious variations of low-carb chili that are perfect for the Super Bowl, or any time you want a tasty low-carb chili dinner! Click to PIN The BEST Low-Carb and Keto Instant Pot Chili Recipes! Click to see 50 Amazing Low-Carb Instant Pot Dinner Recipes. It’s chili weather, the Super Bowl is coming, and many people are watching their carbs this time of year. 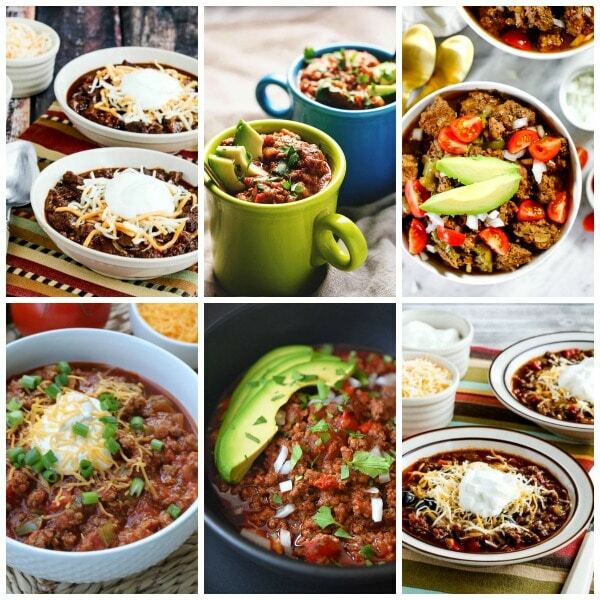 So all those things aligned to inspired us to create this collection of The Best Low-Carb and Keto Instant Pot Chili Recipes! And we found so many interesting options for low-carb and Keto chili from low-carb bloggers around the web that we hope we can inspired you try a few of them and put low-carb chili on your menu more often. All photos are copyrighted to the blogger that posted the recipe. Just click the recipe title under any photo to see the complete recipe on the original site. And watch for a few more Super Bowl party ideas for the Instant Pot coming up this month as well! This Instant Pot Low-Carb All Beef Ancho and Anaheim Chili from Kalyn’s Kitchen is a beefy chili made with chuck roast, and great to serve for a party or perfect anytime! This No Bean Whole 30 Keto Chili in the Instant Pot from Food Faith Fitness is a bowl of creamy, smokey, tender ground beef chili that will satisfy everyone! This chili tastes even better the second day as a leftover. If you love tomatillos, the this Tomatillo Chili (Pressure Cooker) from Ketogasm will satisfy that craving. This is one of those go-to recipes that you will make over and over. This Instant Pot Low-Carb Ground Beef Olive Lover’s Chili from Kalyn’s Kitchen is a winner with most everyone who loves olives! This is a mild chili, a great one to serve for game day. This Instant Pot Ground Beef Chili from Nom Nom Paleo is inexpensive to make and meets the criteria of a comfort food. This looks like a delicious and easy weekday meal. This Keto Chili for the Slow Cooker or Instant Pot from Real Simple Good is Whole 30 and Paleo with a rich, meaty flavor! Made with only 6 main ingredients and some spices, it is a quick easy meal for any day of the week. This Keto Chili from Keto Karma can be made in the Instant Pot or the slow cooker. This is a delicious easy to make meal that you will love. This tasty Low Carb Beef Chili Recipe (Beanless Chili) from The Keto Queens is made using their own blend of spices. This is a tasty, hearty meal for a cold day. This Instant Pot Best Keto Chili Recipe from Kasey Trenum is so full of flavor and a perfect addition to your menu rotation. This is great during football season and a meal the whole family will enjoy! This Instant Pot Turkey Chili (Keto, Low Carb) from Savory Tooth made with ground turkey and ground beef and done quickly using an Instant Pot. Sounds so delicious and easy too! Keto Instant Pot Chunky Chili from Beauty and The Foodie is packed with flavor and low in carbs. Top this chili with avocado and a sprinkle of cheese and enjoy! Keto Beef Chili from Ditch the Carbs includes a lot of tasty low-carb vegetables to add flavor and texture! 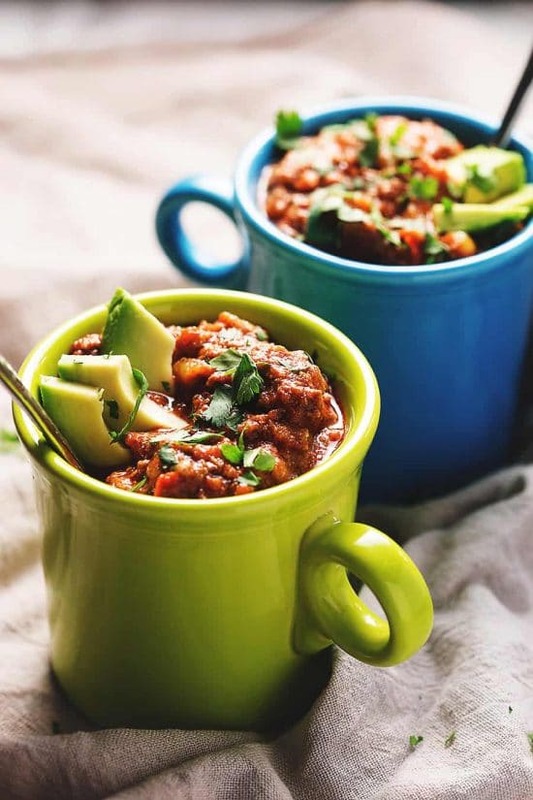 I love the idea of serving in a mug with avocado for this Keto Chili without Beans from Low-Carb with Jennifer!